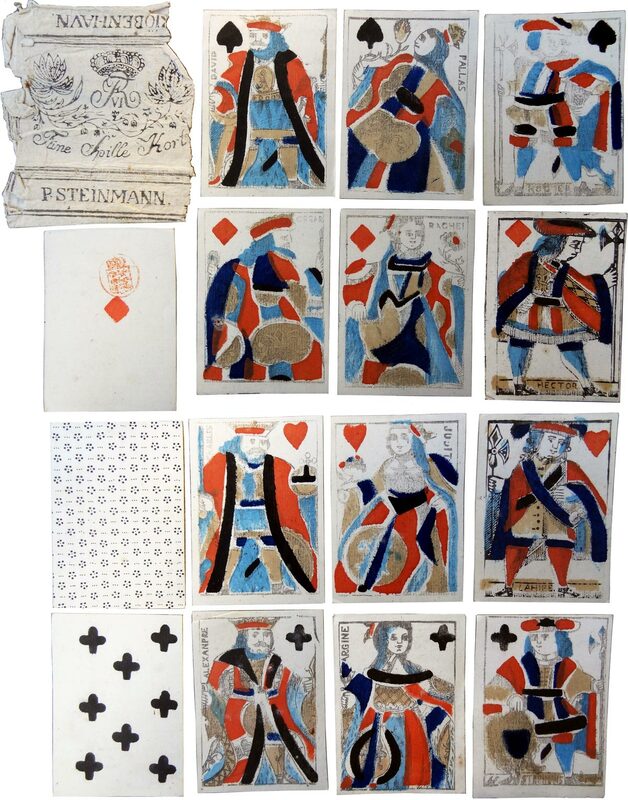 Single-figure provincial Paris pattern playing cards with traditional names on the courts (except the Jack of Clubs) manufactured in Copenhagen by Pierre Steinmann in c.1820. French style playing cards were favoured in many European countries and several Danish manufacturers had been producing standard packs of this type since the 1750s or earlier. It is surprising that France, so haughty in elegance and fashion, should be associated with such grotesque playing cards! The wrapper includes the official Royal Monogram of King Frederik VI of Denmark, who ruled 1808 to 1839, and the Ace of Diamonds carries the official Danish tax stamp showing three lions inside a crowned shield. Above: cards in the French style manufactured by P. Steinmann, Copenhagen, c.1810-20. The manufacturer's name is visible on the Jack of clubs and the wrapper. 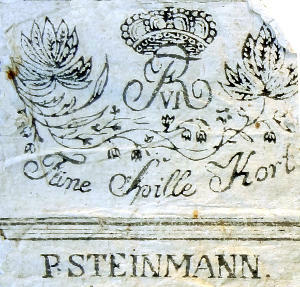 Steinmann had a license for the manufacture of playing cards. The cards have been printed from woodcuts and hand-coloured using stencils in a slightly careless manner using two shades of blue, red, buff and black. The back design consists of a dot-pattern. Images courtesy Hans J. Hinrup.